HomeFashionAlia, Deepika and Katrina paired the pink and red, who stole your attention? Fashion face offs are such an interesting thing. While some are super yay, others are terribly nay. And this happens for countless times in the Indian film industry, where we happen to see two, sometimes three actresses wearing the same or similar combinations or designs on different occasions. Although, it might not be a competition between the actresses to see who wore it better, it sure is an interesting thing for the audience to judge who looked better or which colour suits whom the most. This time, we have the pink and red combination that three of the most beautiful women of our industry donned and they completely nailed it. We're talking about Alia Bhatt, Deepika Padukone and Katrina Kaif. All three of who are absolutely stunning with their fashion outings and have always inspired people through their styling. Every guy's girl crush Alia wore the combination just recently on one of the red carpets that happened. She stole some attention by wearing a one-shoulder baby pink top along with red flared trousers and metallic gold stilettos and let her hair down to finish the look. Deepika sported the same combination, where she wore a shimmery pink one-shoulder top with super flared sleeves and paired it up with red cigarette pants with a tie around her waist. She finished the look with fuschia pink stiletto heels and hair pulled back in a messy bun. It was during Thugs of Hindostan, when Katrina donned the colours pink and red in the form of a pink crop top and a plain red skirt. She let her hair down and wore a wide smile to add to the beauty of the outfit. Sara Ali Khan’s Prabal Gurung ensemble is perfect for date night! 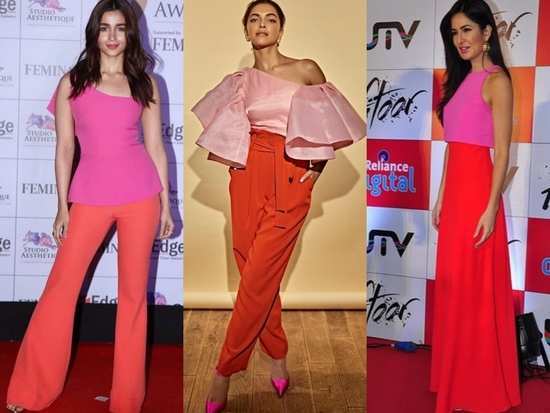 1Alia, Deepika and Katrina paired the pink and red, who stole your attention? 6Sara Ali Khan's latest outing in Topshop proves she's on her way to becoming the next fashionista in B-town! 7'Koffee with Karan': Priyanka Chopra Jonas and Kareena Kapoor Khan turn up the glam! 9Sara Ali Khan’s Prabal Gurung ensemble is perfect for date night!